In the world of negotiating no matter what negotiation styles or negotiating techniques are being used, there is one thing that we can all count on eventually encountering: threats. The threats that we’re going to run into can take on many different forms. The other side of the table may threaten to walk away, file a lawsuit, or damage your reputation. When this happens, we need to be ready for it. What action should you take as a negotiator in order to keep your negotiation on track? When the other side threatens you, often your first instinct is to threaten them back. However, it is generally not a good idea. The reason is because your threats may not be as powerful or credible as the other side of the table’s. If you threaten them, then they could launch an uncontrollable spiral of conflict. As an alternative you might be tempted to immediately concede to your opponent’s demands, but that would only reinforce his domineering tactics. A much better approach is to take the time to understand where this threat is coming from. The first thing that you are going to want to do is to remove yourself from the situation. You can do this by mentally taking a break or by calling for a pause in the negotiations. Next you’ll want to spend time trying to understand what is motivating the threat against you. The other side may be threating you because they feel as though they are a victim and simply want to be heard and acknowledged. Alternatively, they may be simply telling you about the real constraints that they are facing and what other alternatives they have. Finally, they may be making the threat up. In this case the threat is a just a ruse. When the other side decides to threaten you, you’ve got a number of decisions that you are going to have to make. One of the first ones is how you want to react to the threat that has just been presented to you. One of your most powerful ways to react to this threat is to use this as an opportunity to listen to the other side. Clearly there must be a reason why they decided that they wanted to present you with a threat, now is the time for you to find out why they thought that this was necessary. It goes without saying that something has caused the other side to decide that in order to get what they want out of the negotiations, they are going to have to threaten you. What you are going to want to do now is to listen to their grievances, acknowledge their feelings, and apologize for their troubles. The reason that this can be such a powerful thing to do is that studies have shown that when individuals in conflict express their emotions and tell their side of the story, they’re more satisfied with outcomes – even when these outcomes aren’t necessarily in their favor. As negotiators we need to realize that expressing understanding can defuse tensions and reduce the risk of additional threats. At the same time you are going to have to be careful to not to reward tirades with concessions. Once you have been threatened, this is when things can start to get tricky. What you are going to have to do is to discover the implicit advice in the other side’s threat. By asking questions, you can unearth novel remedies to their concerns and avoid caving in to surface demands. When you are asking the other side questions, your goal should be to determine the power or the constraints behind the other side’s threat. The threat that they have made may simply be an expression of their intention to resort to a strong BATNA (Best Alternative to a Negotiated Agreement), in the absence of a satisfactory offer from you. By taking the time to ask about their needs and alternatives, you can determine if a zone of possible agreement exists between you. If so, acknowledge their BATNA, but suggest ways you might both better meet your needs at the table. By asking questions, you can assess whether you’re willing to let the other side pursue their threat, work within the constraints of their underlying concerns, or offer a settlement that takes into account their objective power. When you take a look at the threat that has been handed to you and then assign a label to it (“you are bluffing”), it neutralizes the threat’s negative intent and boosts your sense of control in the negotiation. In fact, process labeling – taking the time to call attention to what’s happening – is the most effective way to get your negotiation back on track. Labeling the situation gives the other side the same detachment that you were able to achieve through threat diagnosis. Every principled negotiation that we involve ourselves in can very easily become an emotional test of wills. If this happens, then it’s entirely possible that at some point in time the other side may become frustrated with the way that things are going and could decide to threaten us. 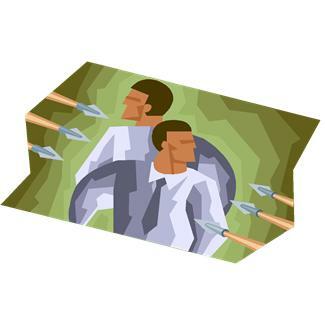 How you choose to respond to that threat may determine the outcome of the negotiation. As you well know, being threatened during a negotiation is a big deal. When this happens our gut reaction is often to lash out and start to threaten the other side. This would be a mistake. Instead, step away from the negotiations and spend some time thinking about where this threat is coming from. Why did the other side feel the need to threaten you? Your next step needs to be to show the other side that you understand where they are coming from. Simply by doing this you may be able to defuse the situation. Once you understand why they are threating you, you need to start to ask questions about the threat. Find out how real the threat is. Finally, so that both of you can discuss the threat you need to apply a label to it so that it can be discussed. Threats generally mean that the other side feels as though they have run out of options. They are using a threat as a way to get your attention and to try to steer the negotiation in a direction that they’d like to go. Your job, when threatened, is to deal with the situation professionally. You need to find out more about the threat and then attempt to work with the other side in order to find a way to defuse it. Question For You: Under what conditions do you think that you should issue a counter threat when the other side has threatened you?